Alex Monteith Swine Fever 2008 2001 Web 720 H264 from Alex Monteith on Vimeo. Swine Fever, Alex Monteith, 2008 from Alex Monteith on Vimeo. 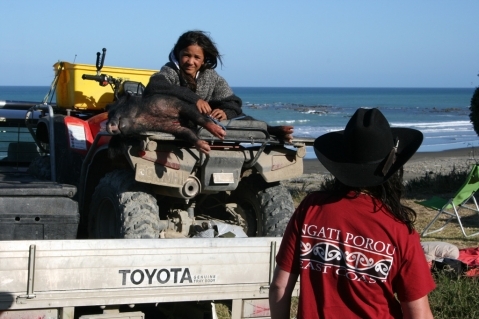 11 year old Kimiora Atkins and her dad Greame Atkins go pig hunting in the Waiapu Catchment (near Ruatoria, East Cape | Ngati Porou) area and return home with a pig. Hand held documentation of the hunt, kill and return to Port Awanui (Omaewa) with the pig. Warning (M) - the video contains hunting scenes.